If you’re having issues with your air conditioner, it can get frustrating pretty quickly. You check the inside unit. You check the condenser box outside. You try to listen carefully to the sounds it’s making to see if you can use the proper description to relay the information to an HVAC professional over the phone. But unless you have some basic knowledge of common AC problems, this guessing game could go on forever. One of the most common problems homeowners can face when dealing with an air conditioner is that it’s either too big or too small for their home. You know how your air conditioner runs for a while, then shuts off when your home is cool enough? This is called cycling. Generally speaking, each cycle should last anywhere between 15 and 20 minutes. If your AC is running for a much shorter period than that, you likely have an air conditioner with a much larger capacity than what your household needs. This leads to increased utility bills since your air conditioner is constantly having to start and stop. Short cycling also decreases the life expectancy of your air conditioner since the motor is being used more frequently to start up the system. When a home has an air conditioner that’s too big for its square footage, the temperature will drop rapidly. While you may think this is a good thing, it also means that your system is experiencing inadequate air flow. This is why: Air conditioners work by absorbing the heat and moisture from the air inside your home. It then extracts the humidity, dripping water into a drip pan. Once the drip pan is full, the water is siphoned out of your house through a condensate line. If your AC is too big, it will cycle off before the drip pan is full. So you’ll have standing water inside the system. Do this through several cycles and you’ll feel the humidity inside your home. Your AC has a sensor that stops air from cooling as soon as the temperature on your thermostat is reached. An AC this large will cause the areas surrounding the thermostat to reach that temperature in a few minutes. The AC will then cycle off before fully cooling down the rest of the house. As a result, the rooms that are further from the thermostat will feel warmer, while the areas close to it will feel cool. Air conditioners release air from one specific set of vents, while another series of vents absorb air from inside your home in order to trap moisture and cool the air. Short cycles mean poor air circulation. Eventually, you’ll start noticing that your home smells damp, mildewy, or stuffy. Air conditioners emit a slight sound that is supposed to fade into the background. However, if the AC is circulating more air than what your home’s ducts can handle, having conversations over the drone of the AC will become the norm. How Do You Measure the Size of an Air Conditioner? There are multiple factors to consider when calculating what size AC is suitable for your home: square footage, ceiling height, number of windows, how hot it is outside on a regular basis, and the type of insulation in your home (you can find this information on a property tax statement). An air conditioner’s capacity is measured in British Thermal Units (BTUs). For each ton of heat that has to be removed from an interior space, an air conditioner requires 12,000 BTUs. The larger your home, the higher BTUs you’ll need. To verify the BTU capacity of your AC system, walk outside to the condenser unit and check for a label on one of the side panels. At the top of the label, there’s a sticker with the air conditioner’s model number (M/N). The model number includes three sections of numbers and letters, separated by dashes. The AC’s BTU capacity is the number included in the second section of the M/N, after the first dash. As a reference guide, below is a chart with the average air conditioner size in reference to BTU. 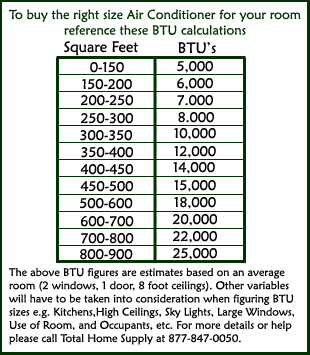 If that much information is overwhelming for you, then take advantage of this BTU calculator that calculates the amount of BTUs you will need in order to cool your home. If you recently purchased the unit, read the sales contract for the seller’s policy on returns or exchanges. If you’ve noticed the size error too late, you’ll want to contact an HVAC professional to replace the inadequate air conditioner for one that is properly sized for your home. Hiring a qualified AC professional you can trust plays a big role in the air quality and comfort of your home. Our technicians at Blair’s Air can help you with all of your HVAC needs in the Tampa Bay area. Contact Blair’s Air today for your FREE service call! Call (727) 800-4148 to schedule your appointment.